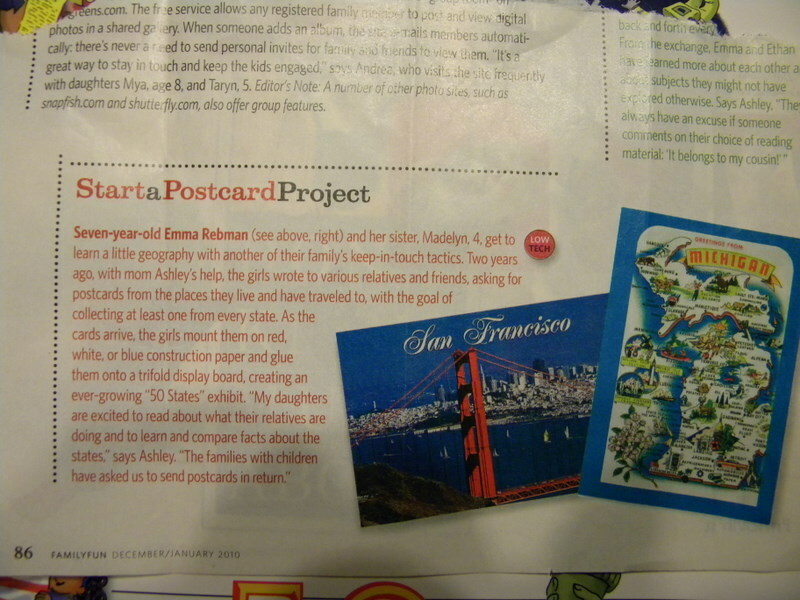 We started studying the 50 States and Capitals in January ~ and as I was pulling the lessons together I found a little project that someone had written to Family Fun Magazine about ~ they started by writing family and friends ~ asking for postcards to see if they could collect all 50 states! 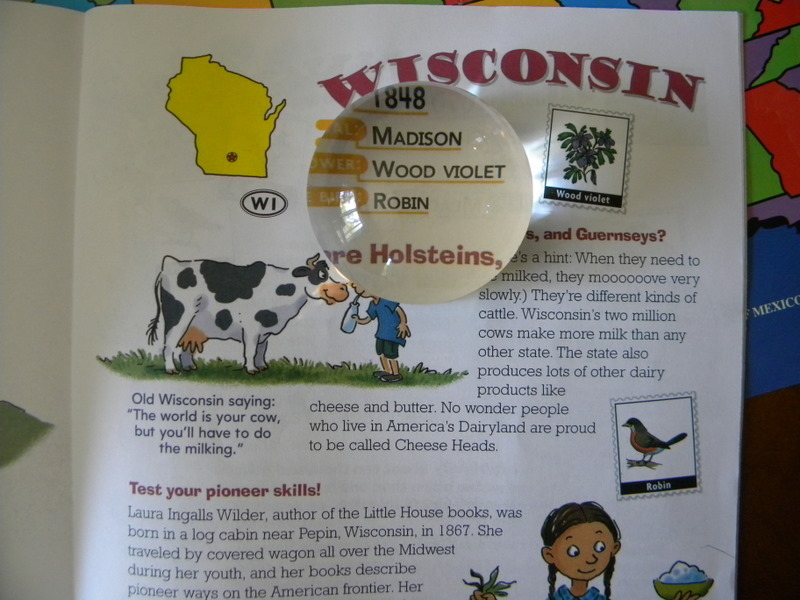 What a fun way to enhance our study of the States!! My husband (aka. 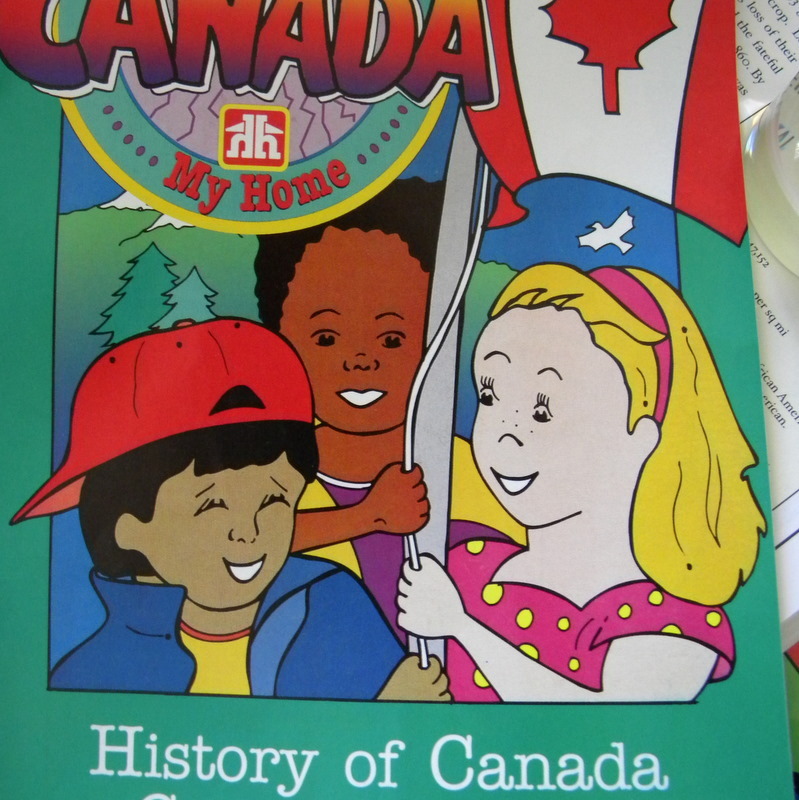 my kids daddy) is Canadian… which makes our kids American and Canadian .. naturally we decided to learn a bit about each Province too… and Sammy is in a class about the 7 continents… so …well… we threw those into our project too! You can see my original post about this fun project HERE. 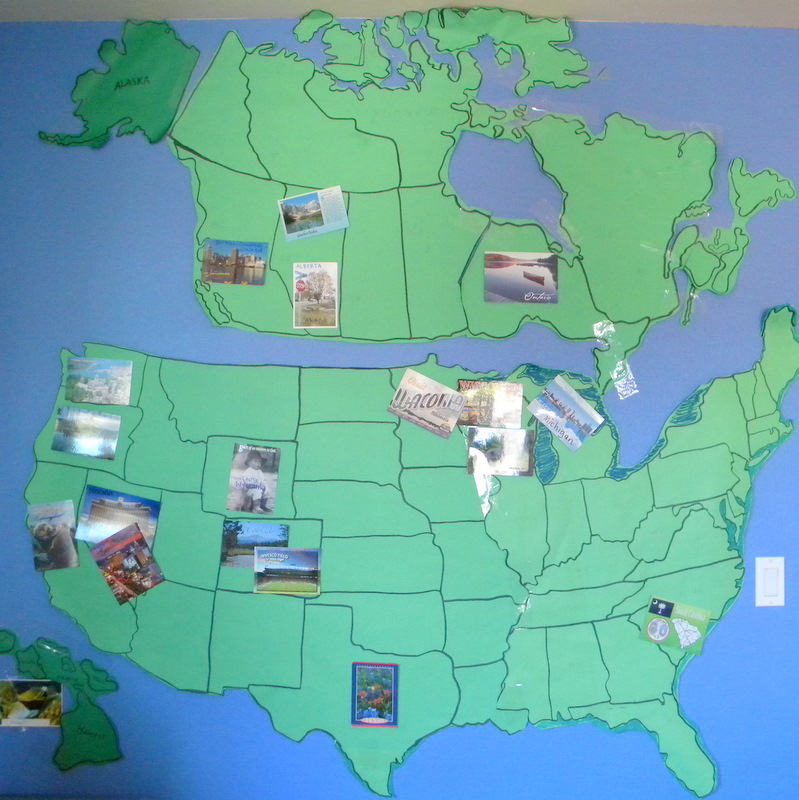 =) Where I asked Bribed my blog friends to send us post cards from your State or travels you happen to be taking! Pennie has a heart of gold ~ she formed a Ministry group called SAMmy’s for mom’s ~ God has clearly blessed this ministry ~ I am blessed to have found Pennie in the land of blog! perfect! one for each child! I recently met Aundrea ~ who blogs from the heart! I am glad to have added her to my list of new blog friends! Thank you Aundrea!! Your clovers will be put in the mail later today! 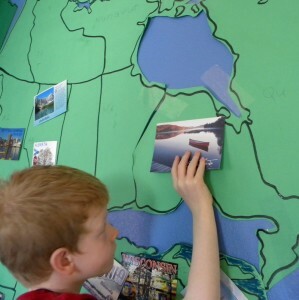 Mr. Mailman brought us a postcard from Jennifer in Ontario Canada too ! 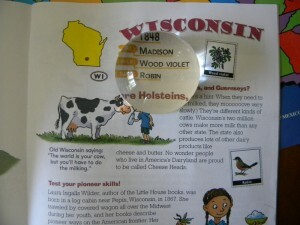 One of my favorite home school resources is this wonderful little book. It has clearly laid out pages with just enough facts about each state. To satisfy the curiosity of a 1st or 2nd grader! Sammy is 7 years old ~ and it is perfect for his age level! it has a 4x zoom =) works fantastic! 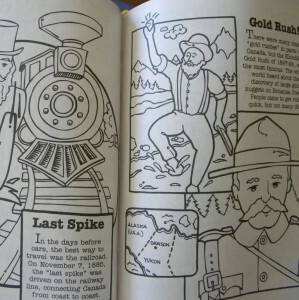 We are also using this coloring book about Canada! 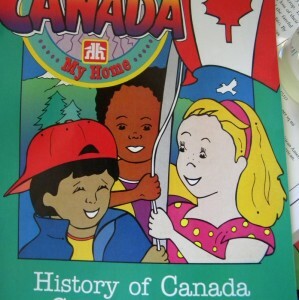 I am still looking for a book with Province facts! 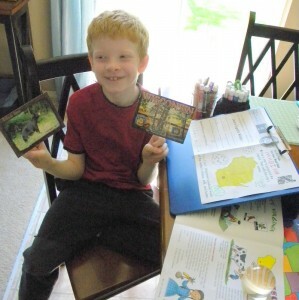 We have a number of other resources that are flash card style, activity pages and a national geographic book that has too much detail for his age… but we can pull a few interesting facts out of! and i never responded ~ I am SO sorry! I stupidly posted that the day before my giveaway!! I tried to respond ~ but likely did not to everyone!! 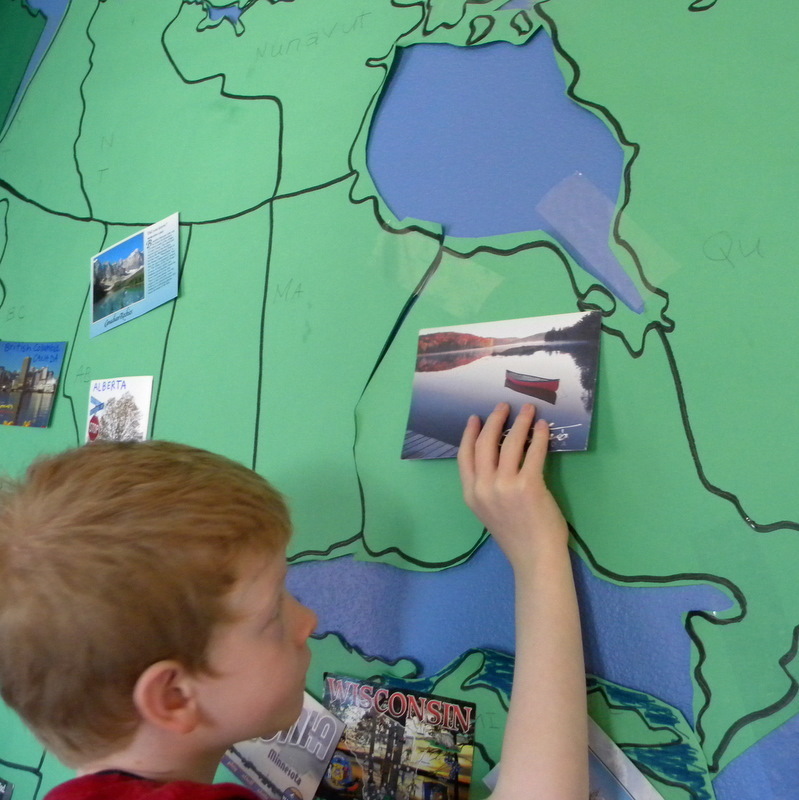 we would LOVE to receive a post card from you too!! and I will personally Thank you on my blog!! if you were willing to help them fill up this map!! We are not even half way there yet!! so we can send you our address!! I better go pick up my little girl ~ speaking of kids!! I believe you already havce on from Michigan, but I could send you another one if you would like! 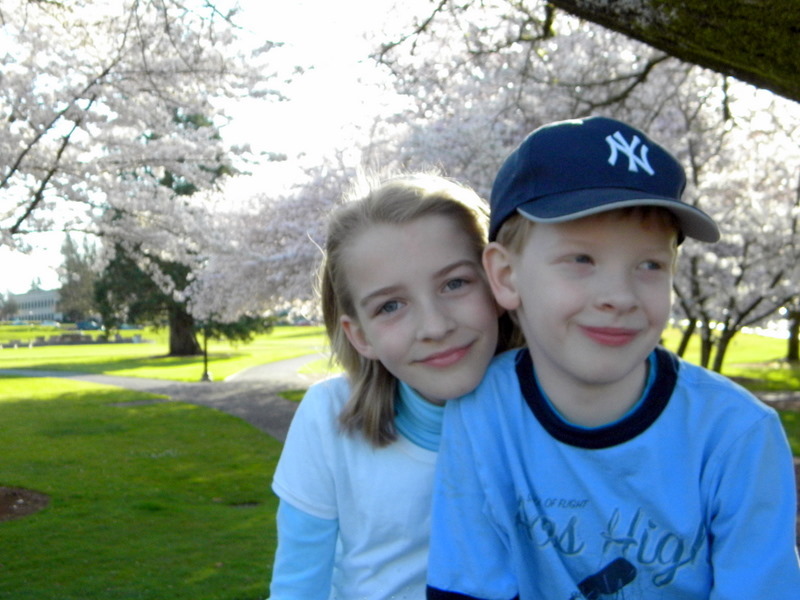 Thanks so mych for stopping by my blog! agree! He is overrated! I would love to help…we are in Michigan. If you need one from Michigan send me your address and I will be glad to send a post card. Thanks! How fun. Thanks for your comment. I know what you mean… there are no private parts anymore. They’re all up for grabs! 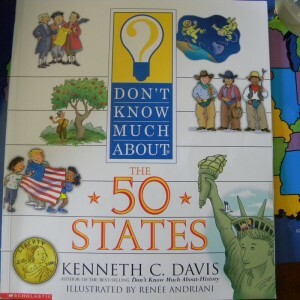 Love your idea on the 50 States. 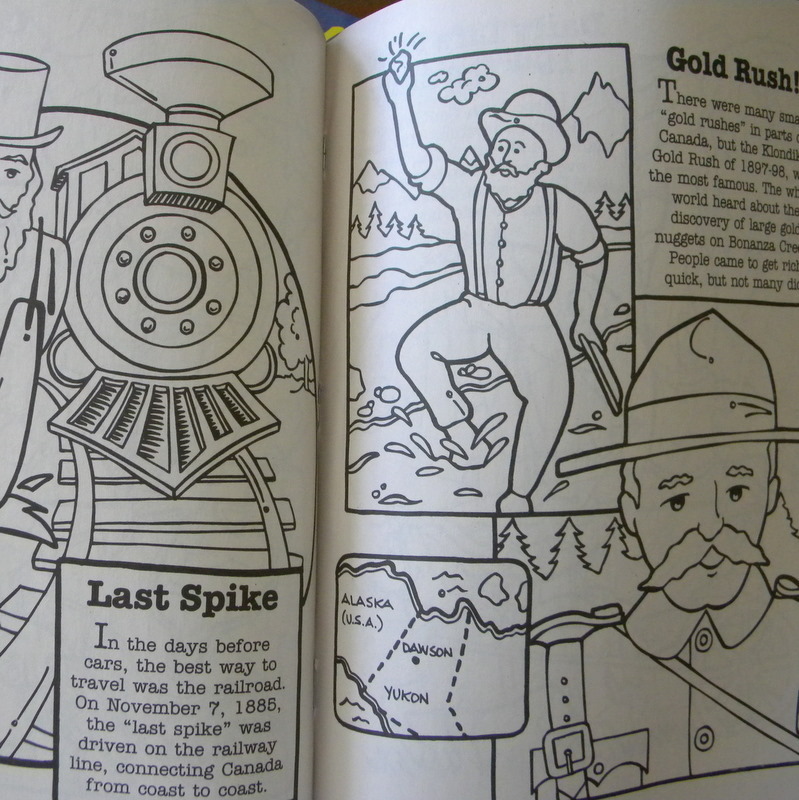 Even though we don’t home school, it seems like something the kids would enjoy. Everyone loves getting mail! thanks so much for stopping by and your oh so sweet comment! it’s great to “meet” you too! Ask and you shall receive my dear. I think someone offered to send you one from Florida when you posted the first time, but if not, let me know! I am SO sorry! I totally forgot to send a postcard! We’ve been so crazy lately!!! I will try to get one this weekend and get it in the mail!!! Sorry! I’m so glad you got the cards. I love this project – how fun! And, glad I could be part of it! 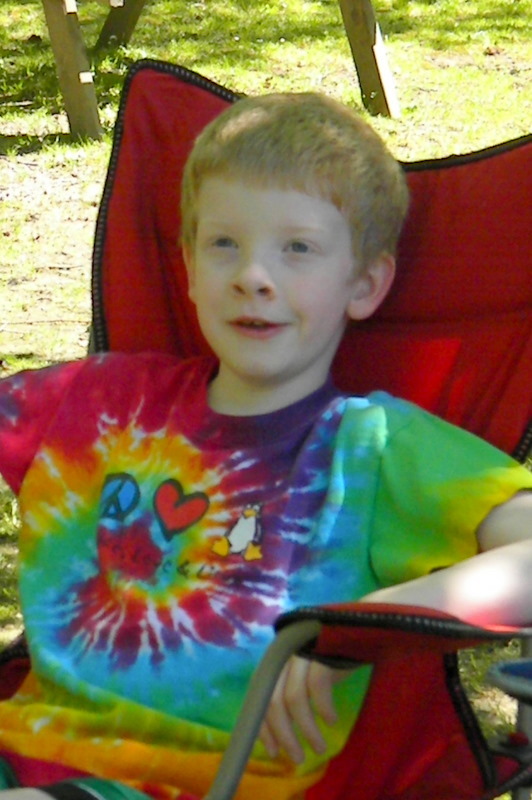 I have an email I want to forward to you about bears in Wisconsin…Sammy will love it! OHIO…I claim OHIO! Let me know your mailing address so I can send it asap! Oh snap, I totally missed that post! And I see you have one from Calgary already. What a great idea though! 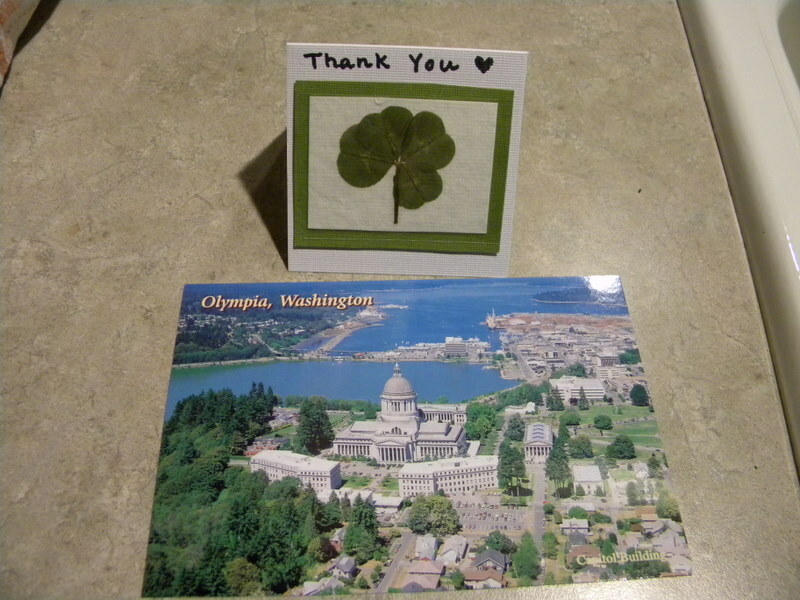 Ooh..I studied in NH and might still have a postcard! I’d be happy to send it to you for your great project! I’ll see if I have anything else that would work to fill in your states! ps I will most likely be driving through Montana, North Dakota, Iowa and Nebraska within the next couple of weeks! It’s really coming along so well! I love it!!! I can see that my state is covered already, and I’m happy and sad about it. Best project ever! Hey, I have another blogfriend that did this last summer and they got all 50 states! I know you will too. I’d love to send a couple from AR. Don’t ya just LOVE Family Fun? It’s arrival is so much fun! P.S. I’m your swap partner via Cyndy! I can send one from Missouri! I’d be glad to participate. looks like you already have a volunteer from Ohio but let me know if you still need one. I’m also going to Texas and Arkansas in two weeks so I could get those too!